The new, cost-effective solution for your bulk material handling jobs is the Chem-Vac Model 40 conveyor–an industrial pneumatic conveyor for plastic pellets and other dry flowable products. At bulk terminals or in-plant, the Chem-Vac Model 40 can be put into service for filling or emptying gaylord boxes, hoppers, silos, bulk trucks, and even unloading rail cars. The machine is compact to make it versatile for your facility. It’s mounted on a 4-way fork-lift base for portability from one work site to another, or it can be permanently installed in one location. The machine cyclone rotates 360°, and the flexible stainless steel piping connects with camlock couplers, so set-up can be accomplished quickly by one person. The patented air filtration system and machine cyclone are easy to disassemble for inspection or cleaning. All other components are conveniently located for maintenance. Transfer rates vary from 15,000 to 40,000 pounds per hour of plastic pellets through 4-inch diameter conveying line, depending upon conveying distances. Vacuum and pressure gauges serve to monitor machine operation, and a high-temperature auto-shutdown switch provides extra protection for the product you are moving. 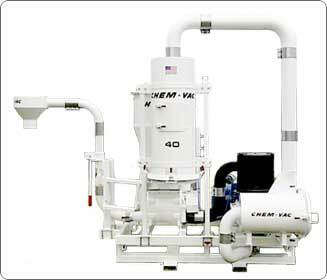 The Chem-Vac Model 40 can be equipped specifically for your material handling requirements. Contact components are available in stainless steel, the air filtration system can be configured for conveying plastic powders, the machine cyclone is available with a quick-release hatch for easier cleaning access, and discharge options include a swivel loadout kit sized for filling gaylords boxes, bulk trucks, or other containers. The load-out kit also includes a quick-coupled lower elbow to allow removal without tools, making it simple to by-pass the kit with a direct pressure-fill connection. Reliable Operation The Chem-Vac Model 40 is equipped for dependable, trouble-free performance. The positive displacement air pump is a heavy-duty industrial model with patented silencer to minimize noise levels. The airlock is cast iron with a relieved rotor, and made to be a high performance, low maintenance component. The new, cost-effective solution for your bulk material handling jobs is the Chem-Vac Model 40 conveyor–an industrial pneumatic conveyor for plastic pellets and other dry flowable products. At bulk terminals or in-plant, the Chem-Vac Model 40 can be put into service for filling or emptying gaylord boxes, hoppers, silos, bulk trucks, and even unloading rail cars.The Chem-Vac Model 40 is powered electrically with a 25 or 40 horsepower electric motor and comes complete with an electric control panel. Small in size but big in performance, versatility, and dependability–the Chem-Vac bulk conveyor is a machine you can count on for your material handling needs. It can handle a variety of jobs in more than one location. Fast, easy set-up, low maintenance design, and one-man operation make it a genuine time and labor saver. Specifications, options, design and descriptions subject to change without notice.